Is it Kaizen or Just Good Management? One of the risks, or should we say unintended consequences of a successful lean implementation is that people become unhappy when “there are no more problems to solve”. This seemed like an odd statement when it was first heard spoken at a recent lean leadership session, so we dug deeper. It turns out that this concern is for those managers who are celebrated as successful fire-fighters. The heroes who solve emergent problems and get things done suddenly lose this element of job satisfaction when the process become stable and predictable as part of a lean transformation. What to do with these fire fighters so they don’t turn into arsonists? We had to explain to people the notion that “no problem is a problem”. This requires redefining for people the lean definition of a problem. A problem is any gap between the ideal and the current condition. Taken to an extreme, by that measure we are nothing but walking problems. Or we could say that if we don’t see problems we have set expectations far too low. In either case, for any business there are many practical and long-term strategic gaps and the lean worker should view these as problems. And when we have problems we do kaizen. At which point another interesting objection was raised: Isn’t this just calling the daily work of management “kaizen”? Don’t we already by definition do or try to do these things? How is kaizen any different from “improvement” or simply good management? Practically speaking and in terms of kaizen as it exists as part of the philosophy of the Toyota Production System, there are three major differences between kaizen and normal good management. Specifically we need to have an clear definition of waste and an agreed set of 7 or 8 wastes, based on an understanding of the business, the customer and what has value. Good management may lack this keen awareness of waste, and while it may be good it may not be “lean” or resource efficient management, since time is spent doing waste rather than actively removing it. Heroic managers may save the day, but do they leave everyone in better shape to face tomorrow’s challenges in their absence? Not often or deliberately enough. It may be personal ability or know-how that allows this manager to succeed. Another difference between good management and kaizen is that a countermeasure taken to address a problem must result in a new standard for that process. That is the check and act of PDCA. We might say that good management has the Do, and maybe the Plan, not always Check and rarely the Act / Adjust. Kaizen defines ideal an state as a result of the countermeasure activities which, sets the next target and the stage for continuous improvement. Good management is satisfied with a job well done, while kaizen is dissatisfied with a job no matter how well done. Constancy implies a steadiness of purpose based on a long-term philosophy also, while improvement of the continuous / discontinuous / innovation order can be long-term focused but is not necessarily. Kaizen and good management need each other. If we think of problems as positive things, or even an enlightened leaders’ reason for being, then we no longer need to flit like the moth to the flame of the latest fiasco, but instead set a steady aim towards a clear big goal and begin to break it down for everyone to work on through kaizen. “A Lean practitioner/thinker is someone who seeks out problems – where none are thought to exist – and then works to eliminate them”. If they can’t then “that is a problem” and the leader’s role becomes one of ensuring their people acquire the correct skills (by being coached and guided through the process) vs. one of jumping in and giving them the answers. 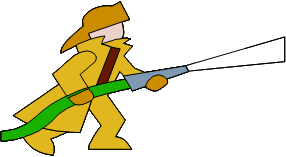 Your firefighter analogy also brings up one of my little stories – about REAL firefighters. Real firefighters don’t sit and wait for a fire to break out, then run in and spray water all over the place. Rather, they study fire, and they know how they expect it to behave. They apply fire suppression as part of a plan – “If we do this here, the fire should do that..” Then they check to see if the fire behaves the way they expected it to. Sometimes it doesn’t. If it does something unexpected, they are going to pull back to safety until they regain understanding of the situation. After the fire is out, they investigate to find the source – where ignition, fuel and oxygen combined to produce a “defective outcome.” The net result of that, ultimately, is fire, electrical and building codes.. the always evolving set of specifications that include the latest understanding to prevent the problem. The net result? Today buildings burn, true. But entire CITIES do not burn anymore. Fires that do break out are handled more quickly and more consistently. And far fewer fires break out in the first place. Perhaps, someday, they will “run out of fires” but until true perfection has been achieved, I think they will always have something to do. Great point about true firefighters Mark. We should stop lumping firefighters in with bad management. They deserve our respect both for the work they do and how they do it. Great post; I especially like how you’ve highlighted the difference between management by heroics and good management. Now I have to figure out how to convey that to management. I would also like to suggest, from your point (1), that all that is needed is a clear definition of waste; I believe that classifying wastes by “type” adds no value to the customer and is therefore a waste, though such classifications do provide some convenient crutch for learning. Thanks for your comment. I disagree that the act of classifying the types of waste adds no value. The more specific your problem statement, the more likely you are to find and address the correct root cause. Also, not all wastes are equal. Waiting time is often not as damaging as defects and overproduction. So knowing the nature of waste and how to calculate the impact of these losses is also important. Having a clear definition of waste is difficult because people are not clear who their customers are or what they value. For example wen we ask “Would they pay you to search for it (motion)?” it brings the idea of waste inherent in the activity we think of as work into clearer focus.